Our prime Midtown East location makes it easy to experience Manhattan. Just two blocks from Grand Central Terminal and the United Nations, we're only minutes from other iconic sites such as Bryant Park, Times Square, and Fifth Avenue shopping.Renew your health in our WestinWORKOUT Fitness Studio, or find a new favorite drink in THE LCL: Bar & Kitchen. Enjoy a meeting of the minds in our meeting space, spanning 15,000 square feet with ample natural light and state-of-the-art technology.Our 774 spacious guest rooms and suites offer refined style and exhilarating city views. Designed with eco-friendly materials, rooms encourage relaxation amid tasteful d cor in rich, neutral hues. Sleep deeply in the sumptuous Westin Heavenly Bed. 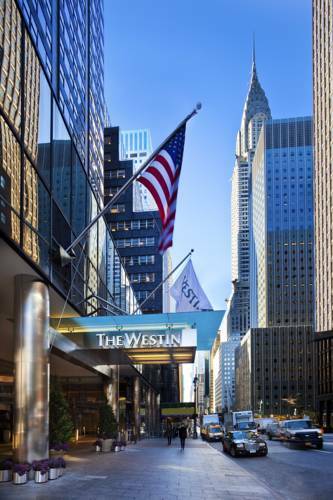 With an ideal location in the heart of midtown Manhattan, The Westin New York Grand Central is perfectly situated for business and leisure. Nestled between Grand Central Terminal and the United Nations, our hotel offers unparalleled access to top city attractions either on foot or by cab or subway. We are a short walk away from Bryant Park, which features the citys second longest expanse of grass, free skating in the winter, food kiosks, and a custom-built carousel, and sits alongside the New York Public Library's stately main branch. Also close by are the iconic Chrysler Building, Fifth Avenue shopping, and Grand Central Terminal, a destination in itself. Adjoining Manhattan to the tri-state area via Metro-North Railroad, Grand Central features more than 75 shops and restaurants. Access to numerous New York City subway lines is also available underneath the terminal. Among the myriad other cultural and tourist attractions within a 20 to 25-minute walk from the hotel are Times Square, the Museum of Modern Art (MOMA), and Rockefeller Center. Our creatively-designed restaurant delivers the simple earthly pleasures with seasonal fare in innovative flavor combinations, tempting cocktails and craft beers, and pleasingly healthy and tasty breakfast options.